The latest version of the Barracuda Web Security Gateway (formerly Barracuda Web Filter) delivers new features and benefits for our customers. In this post, I will take you through some of the details that version 9.1 has to offer. Let's start with the Web Categorization Service (WCS). If you are familiar with web filtering, you are probably familiar with URL filtering using a category database. This technology makes it easier to block groups of sites, based on the site content. For example, if you'd like to block gambling, you could block all gambling-related sites by selected the gambling category. Obviously this is much more practical than finding and preemptively blocking all of the individual sites of concern. This technology worked well for years, but as the number of websites continues to grow, the category databases have become very large. There are tens of millions of URLs in these databases. This means that the databases take longer to download, they are harder to transport, and they require more computing power than ever before. They are also an average of 24 hours old by the time the web filter begins to use them, because the average customer updates these databases once per day. The Web Categorization Service improves upon the old database system in several ways. Already on: Starting in firmware version 9.1, WCS is on by default, making it easier for all customers to benefit from this technology. Reduced caching: WCS creates a local cache of the top two million sites requested through the Web Categorization Service on that day. A separate ‘user cache' is created for the top sites requested by the customer. Dynamic classifications: Nothing goes uncategorized. 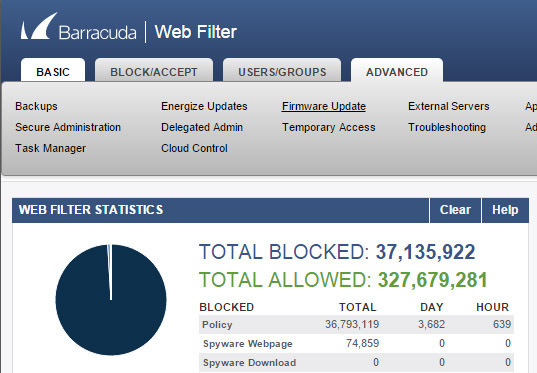 If a site does not exist in cache, the Barracuda Web Filter will query the WCS. If the site is not listed in WCS, the service will crawl the site and create a categorization based on the detected content. The response is returned to the Barracuda Web Security Gateway that performed the query. The data is further evaluated by the Barracuda Real Time System and resubmitted to the WCS. We have also added Google Consumer Apps in Web App Control. Customers using Google Apps can now create permissions to allow users to access corporate-sponsored Google applications, while blocking access to personal Google accounts. This means that employees will be able to access corporate Gmail and use corporate Google Docs, but not access personal gmail or upload company data to the personal Google Drive. Companies now have more control and visibility into what documents are transferred between the user and the Google Docs service. Customers can also block applications, such as Google Hangouts, if desired. The applications available in the Google Consumer Apps interface are determined by Google. 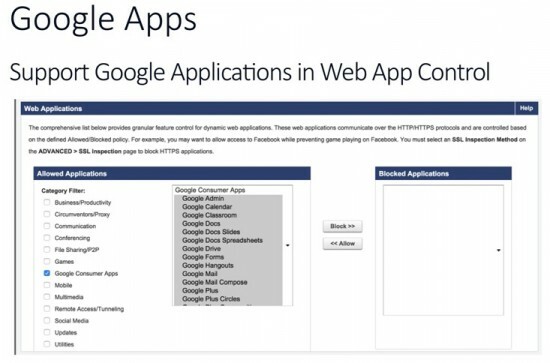 Barracuda has no control over what is listed in the Google Consumer Apps list of applications. The Malware Removal Tool is being replaced with a new tool soon. The Barracuda Web Security Gateway has often been able to detect malware on a network that the old Malware Removal Tool could not detect. This created a problem when the Barracuda Web Security Gateway triggered an alert and advised the administrator to use the removal tool to clean the infected device. The Malware Removal Tool was not always able to detect and remove the malware. Starting with version 9.1, the Barracuda Web Security Gateway will continue to detect infections and report the details to the administrator. The administrator can then use corporate endpoint solutions to manage the detected malware. Customers with current Energize Updates subscriptions can download version 9.1 through the Barracuda Web Security Gateway administration panel. Click on the ‘Advanced' tab and select ‘Firmware Update' from the menu at the top. If you would like more information on the Barracuda Web Security Gateway, visit our corporate site here. If you'd like to try the product in your own environment, you can request a risk-free, 30-day evaluation here.